Terrifying as it may sound, Mother's Day is quickly approaching. Since May 8 is only a week or so away, I figured it would be a lovely time to fit in some gift ideas for the women who make the world go 'round. My mother is definitely a pro in the kitchen, so I created this post with her in mind, but I'm sure that she isn't the only mother who has wonderful culinary skills. From something as prime as a new knife set to a nice cookbook, one thing's for certain: the mother who loves the kitchen, loves gifts she can put to use in the kitchen. Just compiling this list, I've discovered so many whimsical takes on classic cookware and other kitchen necessities. If you can imagine it, it exists as the perfect gift for the mother(s) in your life. 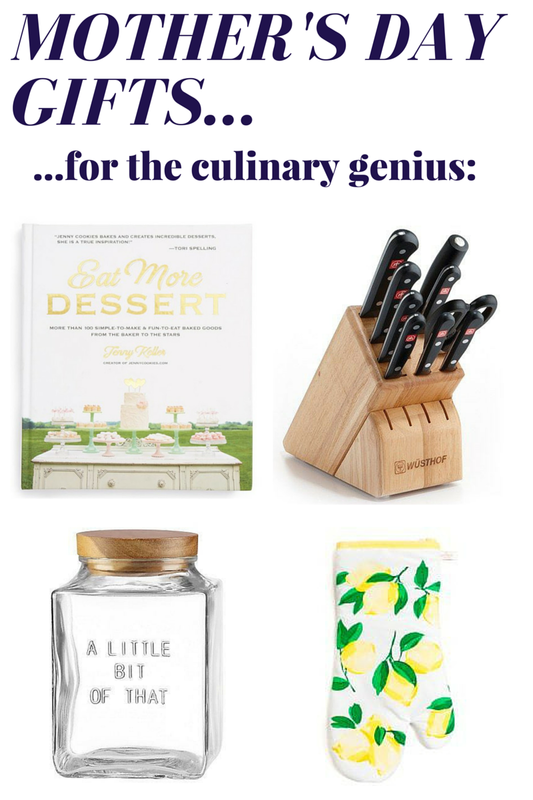 What other gifts do you think are perfect for culinary-loving mothers? That oven mitt is too cute! !